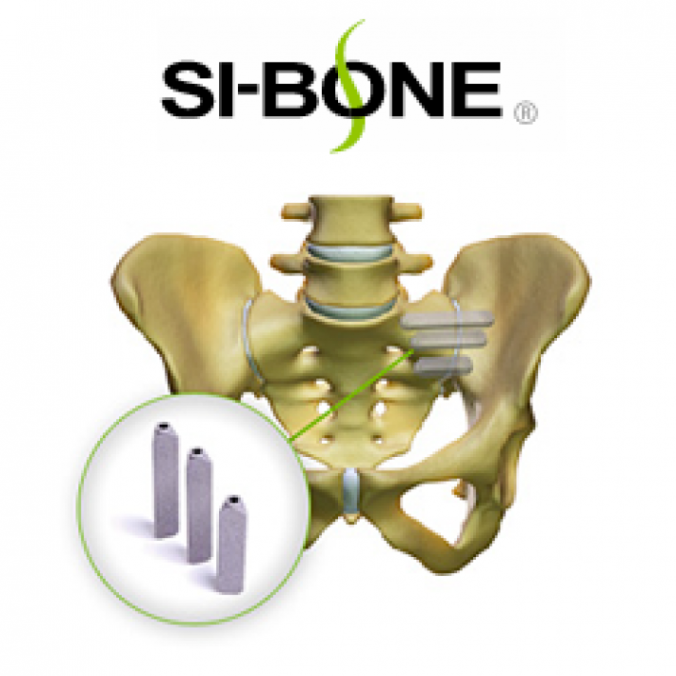 SAN JOSE, Calif., Aug. 9, 2017 /PRNewswire/ — SI-BONE, Inc., an innovative medical device company that pioneered the use of the iFuse Implant System® (iFuse), a triangular shaped minimally invasive surgical (MIS) device indicated for fusion for certain disorders of the sacroiliac (SI) joint, announced the publication of a systematic review of diagnostic accuracy studies titled Clinical classification in low back pain: best-evidence diagnostic rules based on systematic reviews1. The article, published in the journal BMC Musculoskeletal Disorders by Petersen, Laslett and Juhl, is the first comprehensive systematic review of diagnostic accuracy studies. The goal of the study was to develop clinical diagnostic rules for identifying the most common disorders of the lumbar spine. The study reports strong clinical evidence that the SI joint can be diagnosed as a source of low back pain with an acceptable accuracy using 3 of 5 positive provocative maneuvers and the presence of pain localized over the posterior superior iliac spine (PSIS) when other sources of pain have been excluded. The focus of the review was to outline the diagnostic value of signs and symptoms for use in primary care without access to additional more expensive and invasive confirmatory tests. The intent was to provide an evidence-based clinical diagnosis with acceptable accuracy that may reduce the need for invasive or expensive diagnostic methods. In a primary care setting, the clinical prediction rule for the diagnosis of SI joint pain, using a cluster of 3 of 5 positive provocative maneuvers in the absence of known discogenic or radicular pain, and dominant pain localized over the posterior superior iliac spine (PSIS), are as good or in most cases better than the clinical prediction rules for other lumbar spine conditions. The SI joint has been attributed as a source of pain in 15-30 percent of patients with chronic low back pain2-5, and in up to 43 percent of patients with new onset or persistent low back pain after lumbar fusion.6 Patients with SI joint disorders may feel pain in the lower back, buttocks and/or legs localized over the posterior superior iliac spine (PSIS). This can be especially true while transitioning from sitting to standing, stepping up or down, bending and lifting, walking, sleeping or even just sitting on the affected side. SI joint pain is often misdiagnosed or misattributed to other causes, as not all healthcare providers evaluate the SI joint, and most patients do not ask about it. SI joint disorders can be identified through a series of simple tests that include when a patient identifies their pain by pointing directly to the PSIS (the bony prominence overlying the SI joint), known as the Fortin Finger Test. The diagnosis is confirmed with an appropriate physical examination and image-guided diagnostic injections directly in the SI joint. The iFuse Implant System provides a minimally invasive surgical solution to fuse the SI joint using triangular titanium implants that create an interference fit within the ilium and sacrum. The triangular implant shape and press fit insertion technique are both patented and designed to provide immediate fixation by minimizing the SI joint’s unique motion of nutation. The implants have a porous surface that provides an environment conducive to ongrowth and ingrowth7, facilitating long-term fusion of the joint. The iFuse Implant, marketed since 2009, is the only commercially available SI joint fusion device in the United States with published prospective clinical evidence from multiple studies that demonstrate improvement in pain, patient function and quality of life. SI-BONE, Inc. (San Jose, California) is a leading innovative medical device company dedicated to the development, manufacture and commercialization of minimally invasive surgical devices for the treatment of patients with low back symptoms related to certain sacroiliac joint disorders. SI-BONE, Inc. first received 510(k) clearance to market its iFuse Implant System from the Food and Drug Administration in November 2008. The CE mark for European commercialization was obtained in November 2010. MacBarb, et al., “Fortifying the Bone-Implant Interface Part II: An In Vivo Evaluation of 3D-Printed and TPS-Coated Triangular Implants,” Int J Spine Surg, 2017; 11.